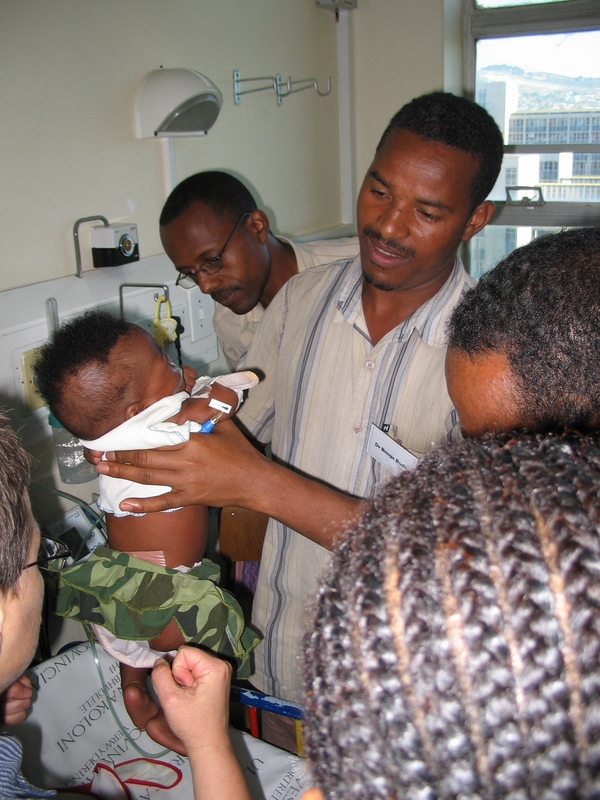 When Gilbert Tene, a Rwandan pediatrician, first examined Joseph, the 9-month-old baby boy had acute pneumonia and severe failure to thrive. His short life had already been marked by repeated episodes of illness—fevers, diarrhea, coughs. He was severely malnourished, weighing only about 12 pounds, and could not sit steadily by himself. His diagnosis: advanced HIV disease (WHO stage 4). Treating HIV/AIDS in resource-poor settings is hard enough, with health worker shortages, drug supply glitches, and other hurdles hindering quality care. But when the HIV-positive patient is an infant, the job is even more daunting. There are obstacles at every turn, from individual patient diagnosis to case management to weak underlying country health systems, says Dr. Tene, a pediatric HIV specialist with Columbia University’s International Center for AIDS Care and Treatment Programs (ICAP) in Rwanda. Take, for starters, the unreliable access to appropriate HIV diagnostic tests for infants, because of cost and other factors. Then, there’s the lack of infant and child formulations of the most commonly used first-line ARVs. Sometimes you have to work out dosage by measuring a child’s body surface area and make adjustments as a child grows, says Mark Cotton, MD, a professor of medicine at South Africa’s Stellenbosch University and a pediatrician specializing in HIV care. A health care clinic’s staff must have the time, the equipment, and the ability to accurately weigh a baby, translate that weight into a new drug dosage, and then explain to the mother how to measure the adjusted dose. And a key drug in the ARV regimen prescribed in many resource-poor countries, lopinavir/ritonavir (also known as Kaletra), is sometimes not well tolerated by children because of the terrible taste. “How about a combination of battery acid and bile?” Dr. Cotton offers when asked for a description of the drug’s taste. All of these challenges are compounded by the crippling shortage of health care professionals in low-income countries. Because of a scarcity of pediatricians, most of the work treating HIV in children is done by generalists. But caring for HIV-infected children is very different from treating adults, involving myriad complications—as evidenced by the case of 9-month-old Joseph–that can seem overwhelming to even the most seasoned physicians. “In many cases, there’s a belief that pediatric HIV is too difficult to manage and HIV-infected children, because they are to die sooner or later, have no future,” said Dr. Tene. Dr. Abrams and others have set out to change that, with a unique cross-continent collaboration between ICAP and Stellenbosch University, which joined forces to design a program, the South-to-South Partnership (S2S), offering training in pediatric HIV treatment to African health professionals. “As the ART roll-out was happening [in the developing world], it became clear that pediatrics was a neglected area and was lagging behind,” says Dr. Abrams. 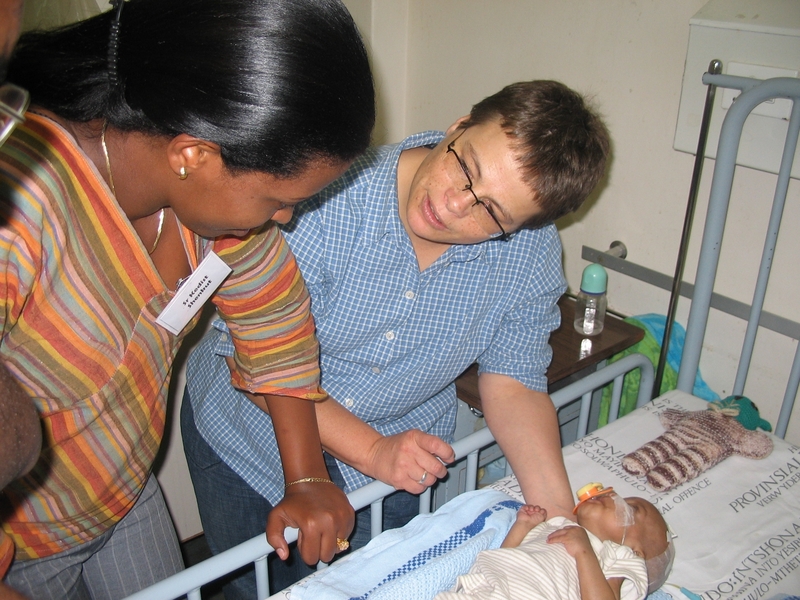 Funded by the U.S. Agency for International Development and first launched in 2006, S2S was designed to build pediatric HIV capacity in Africa, bringing multidisciplinary teams of providers to Stellenbosch for both didactic and hands-on training, including rotations at Stellenbosch’s Tygerberg Children’s Hospital that offer real-life lessons on providing HIV care to infants and children. “The idea was to train people who were going to bring this knowledge back to their own programs,” says Dr. Abrams. Rather than import physicians from the West for the training, S2S taps local HIV expertise in South Africa, an epicenter of the AIDS epidemic. ICAP worked with Ministries of Health and national AIDS programs to identify doctors and nurses who would best benefit from the training and brought staff from programs in countries where ICAP supports HIV prevention, care and treatment services, including Kenya, Ethiopia, Rwanda, Mozambique and South Africa, to participate in the initiative. The challenge of treating HIV infants and children is one that wealthy countries, for the most part, do not have to face; because of wide access to medical specialists, HIV testing and drugs to prevent transmission of the virus to newborns, there is very little HIV in babies or young children in the U.S. and other developed countries. “But in resource-poor settings, HIV is an ongoing epidemic” affecting hundreds of thousands of children, Dr. Abrams notes. About 230,000 children died of AIDS-related causes in 2008. And an estimated 430,000 babies and children were newly infected with HIV in 2008, about 16 percent of all new infections. The vast majority of those occurred through preventable mother-to-child transmission. At the end of 2008, only about 275,700 children were receiving lifesaving ARV drugs, less than 40 percent of those in need. The consequences of inadequate or inaccessible pediatric HIV treatment are dire. Worldwide, an estimated 2.1 million children were living with HIV/AIDS in 2008. Without treatment, half of all HIV-infected infants will die before they reach their second birthday, and nearly 75 percent of these children will die before they turn five. S2S has helped make significant inroads against that tide of grim statistics. In the program’s first four years, more than 400 health care workers—from Nigeria, Ethiopia, Zambia, Rwanda and elsewhere—have come to Stellenbosch for the training. 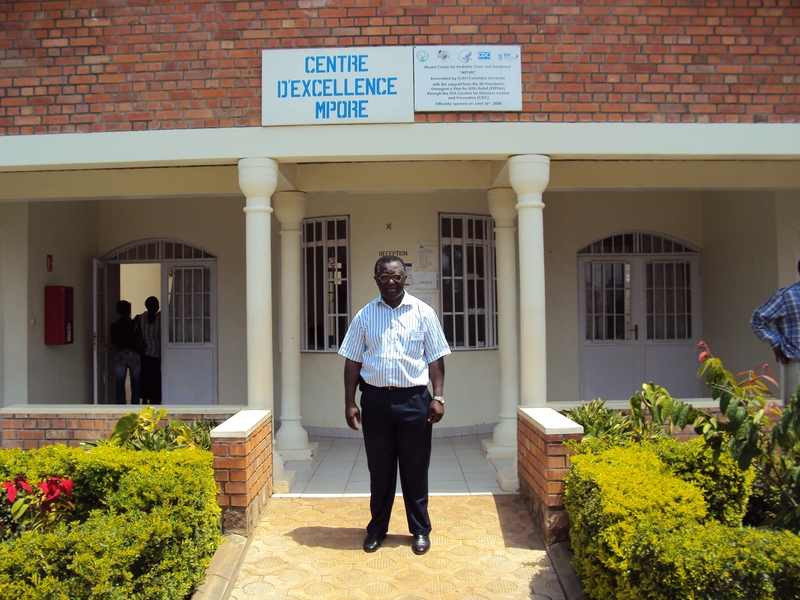 Exhibit A is a new pediatric center for excellence in Rwanda, modeled after the S2S program and led by, among others, Dr. Tene, who received the S2S training himself in 2007. Once back in Rwanda, Dr. Tene kept working with the S2S team to facilitate training of other ICAP Rwanda team members and other health care providers at the country’s national institutions. “This helped to constitute a pool of trainers who have been, since then, training care providers on pediatric HIV care and treatment in Rwanda,” Dr. Tene says. In addition, ICAP worked with the Kigali Central University Hospital (KCUH) in 2007 to create the pediatric center of excellence; the center is now fully operational, with a cohort of 250 HIV-infected children who receive high quality comprehensive care. Also with the support of ICAP, Rwanda has launched a pediatric practical training program at the Kigali hospital, using adapted concept and training materials from the S2S program and the model of pediatric care implemented at KCUH to train multidisciplinary teams from district hospitals and health centers—an effort to enhance implementation of high quality care for children across the entire country. “The collaboration with the S2S program is for us so nurturing, and we keep on looking for ways for its continuous strengthening for mutual benefits through study visits and experience sharing,” Dr. Tene says. It has also helped turn a bleak future brighter for children like Joseph. Although his treatment was rough going and included some setbacks, he is now doing well on antiretroviral drugs, along with nutrition counseling and psychosocial support for his family. Dr. Tene reports that after 2 years and 3 months of treatment, Joseph now weighs about 30 pounds, shows good neurodevelopment, and can walk and talk. Editorial note: Joseph is a pseudonym. The child’s real name was withheld to protect his privacy and that of his family.